If I could only get one facial for the rest of my life, it would be the Bliss Triple Oxygen Treatment. So when I found out that there's now a mask engineered to mimic that facial's effects -- namely, the Bliss Triple Oxygen Instant Energizing Mask -- I jumped at the chance to try it. 1) The mask works in just 5 minutes. 2) As you massage it into your skin and let it work its magic, it foams and becomes super tingly. 3) It works on even the most sensitive skin. 4) In just one use, your skin will GLOW. 5) Also in just one use, dryness and dehydration disappear. Fresh, younger-looking skin in just minutes? I know you're thinking it's impossible. But with the combination of oxygen, innovative Fluid02 technology, powerful antioxidants and Vitamin C, this mask really and truly works. 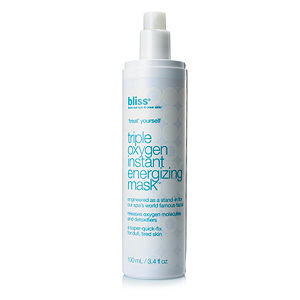 The Bliss Triple Oxygen Instant Energizing Mask retails for $54 at beauty.com. I love this mask for an instant facial pick me up. To intensify the "energizing" effects I keep the mask in the fridge so the cold sensation instantly boosts circulation, brighten and tightens the skin. My sisterand I both used this before our weddings and love it! I use it all the time! !